Good tower, probaly the best Ive been on, although its close. I much prefer the shooting down side rather than shooting up, it makes a huge difference. Shooting down gives you a very nice perspective of Cedar Point and is more thrilling by waiting at the top for several seconds. Shooting up is kind of boring and doesnt do much for me, with no airtime and no real intensity. But with the comfortable restraints this makes either side a decent enough ride. 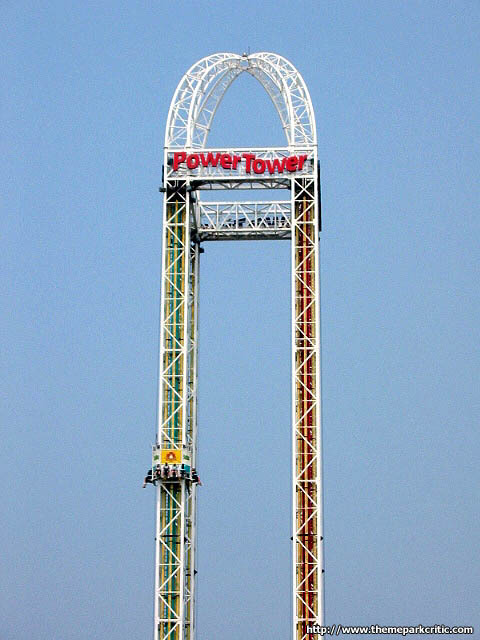 A must ride at Cedar Point for me. Doesnt have the sheer height of the Stratospheres Big Shot, but a fantastic free fall ride. Probably the most fun Ive had on this type of ride. Unfortunately, Ive only tried the drop side, not the side that shoots you up. Guess itll have to wait for my next visit to CP. I just want to say that this is as thrilling to watch as it is to ride. The height alone is great for a tower ride. Both ride experiences are great, but I prefer the Turbo Drop side, just because it takes you high above the earth and then without warning, drops you back down and hops you back up again and again. 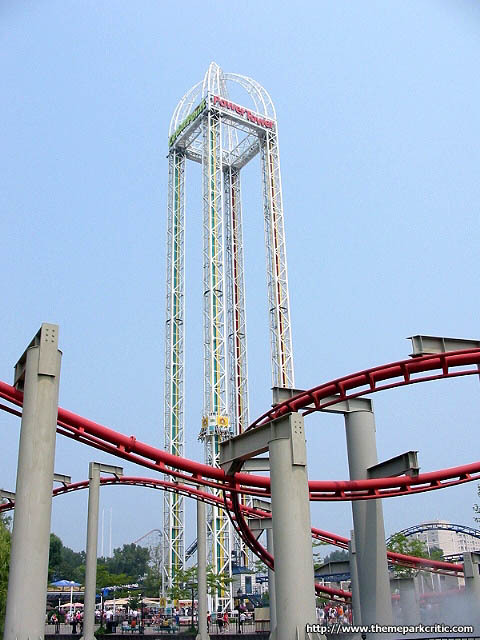 It is actually the Drop and Catapult in one. Simply thrilling!!! Uhhhh.. wheres the fun? Went up the Space Shot side, and was waiting for a thrilling launch, but I was sorely, SORELY let down. It wasnt a bad ride, but I didnt enjoy it nearly as much as others, and Im left wondering how they thought it was worth 9s or 10s. The drop side beats the up side hands down, but the up side gives good air when it reaches the top. The drop side has even better air when you dont hold on to your harness. We took a ride on the "launch" side of Power Tower. Overall I didnt think it was too intense. I was kind of dissapointed. Hopefully I will return to the Point to ride the "down" side. After that my rating may go up. My favorite drop ride since it is so tall. I personally like the Turbo Drop because you get a great freefall sensation. The Space Shot doesnt give that feeling (although the airtime at the top is great). 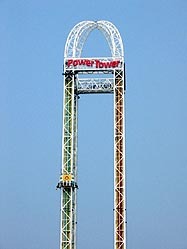 I like to ride it after Top Thrill Dragster because it is near the exit. I cant give it a 10 because its just a big pole you go up and down on. That being said...the drop part is really really awesome. You get like 4-5 seconds of free fall and you get a gorgeous view of the park while you wait. Ride this thing at night as the park closes and its even better. Love the space shot side. I never tried the other side though. Just the thought of waiting up there freaks me out just a little!! I was actually scared to go on it at first. When me and my sis climbed into the very comfortable seats I was like ah how do i hold on..should i open or close my eyes...will i get whiplashed?! Yea i wonder a lot. The air thingys made all these scary sounds that didnt help at all. I held on so tight to the harness. I feel myself jerked up so fast i instantly close my eyes scared to see how high up we were going to be. My sister yelled at me to open them to look at the view and WOAH wat a good one! I could see the whole park and even more! I got off happy having experienced that fun S&S tower. Definitely gota ride this at CP! It wouldnt be CP without it!! !